Description: This fully scripted Kindergarten half day lesson plan is broken down into 2 separate segments (60 minutes each). 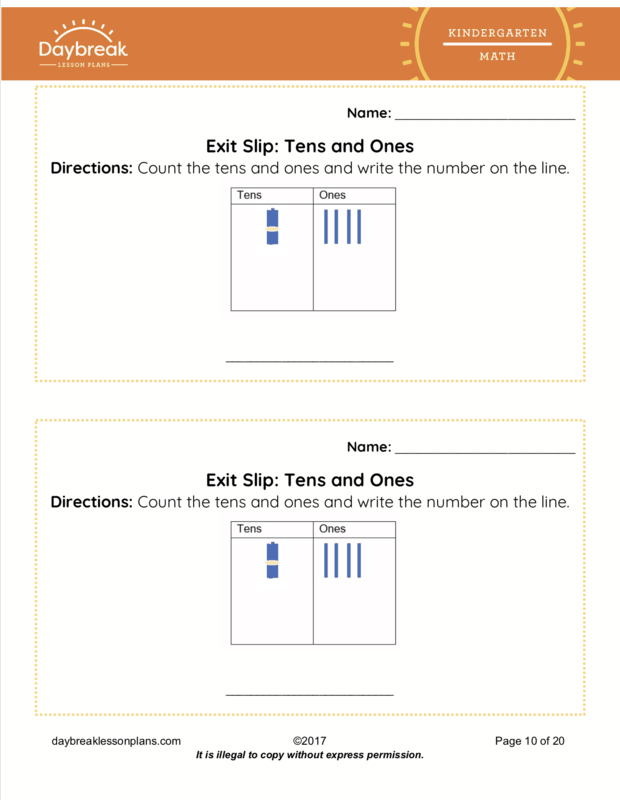 These lessons address Numbers in Base Ten: compose and decompose numbers 11-19 into tens and ones (K.NBT.1.1). 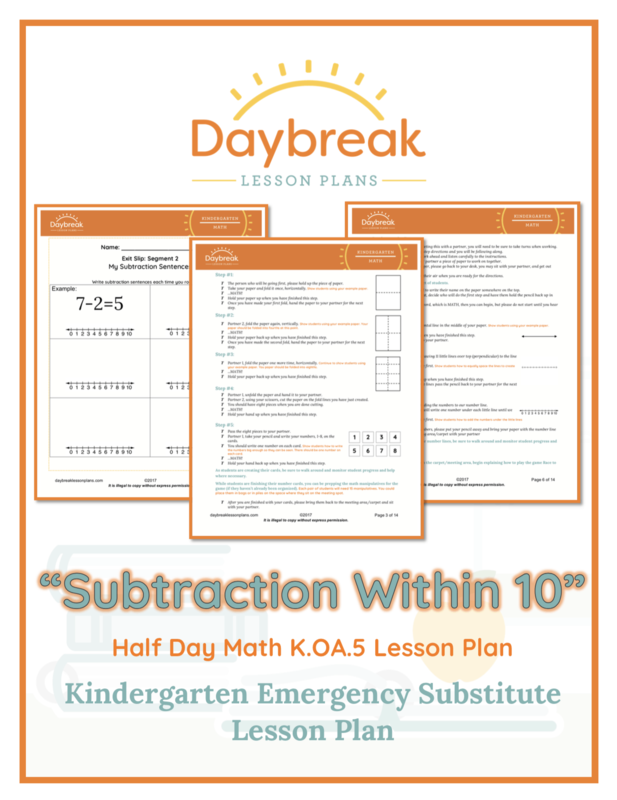 Description: Kindergarten half day of math lesson plans containing 3 separate segments (20-60 minutes each) addressing Operations & Algebraic Thinking: subtraction within 10. 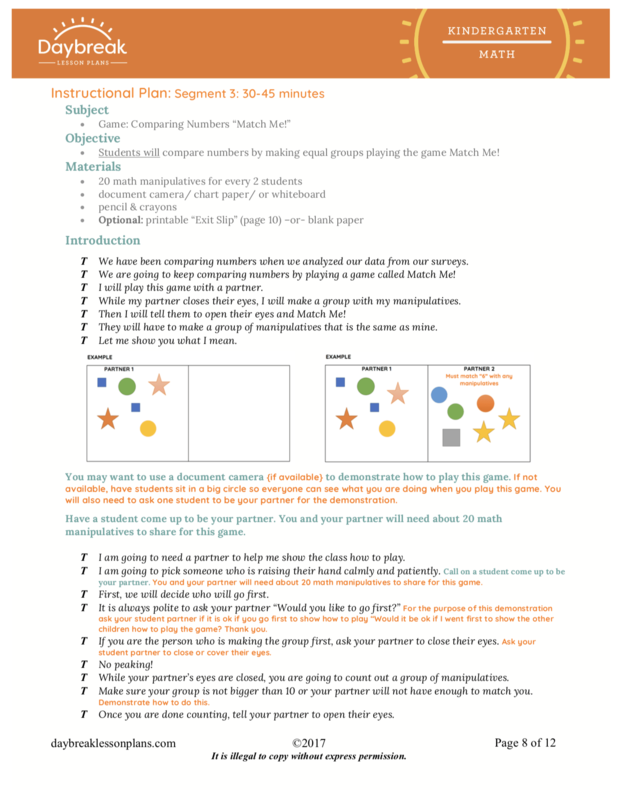 These lessons include playing a game "Match Me Minus 1"; using manipulatives to subtract, playing the game, "Race to Zero"using a number line to subtract, and last independent practice of subtraction within 10. 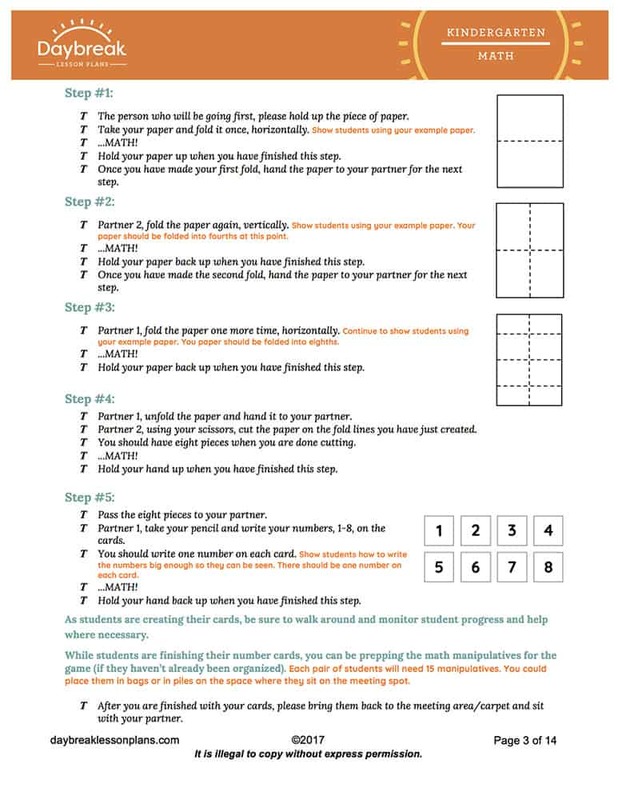 Description: Kindergarten half day of math lesson plans containing 3 separate segments (45-60 minutes each) addressing addition word problems within 10 (K.OA.2). 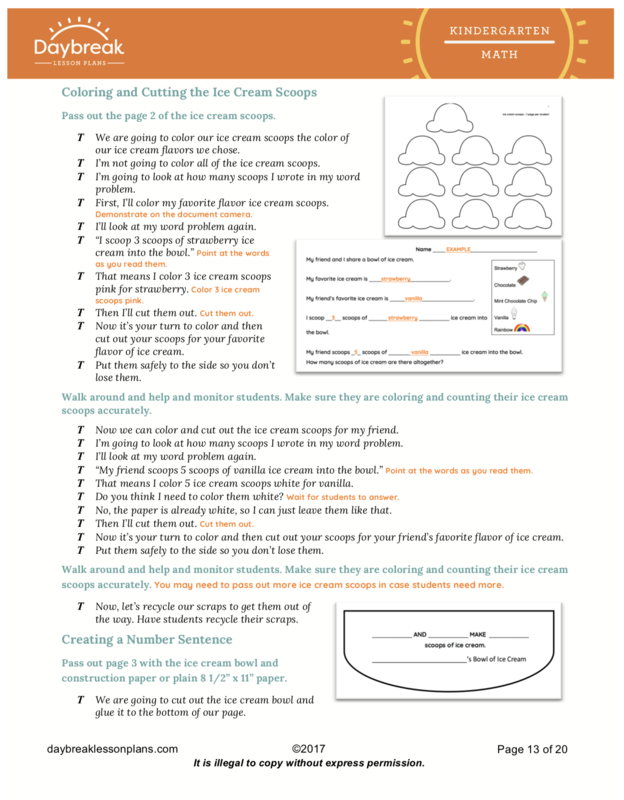 These lessons include: solving addition word problems through acting out the problem, creating drawings to represent the problem, using objects, and finishes with an ice cream sundae craft where students will create their own word problem including a number sentence to match. Description: Kinder students will discover different aspects of a narrative including an understanding of characters. 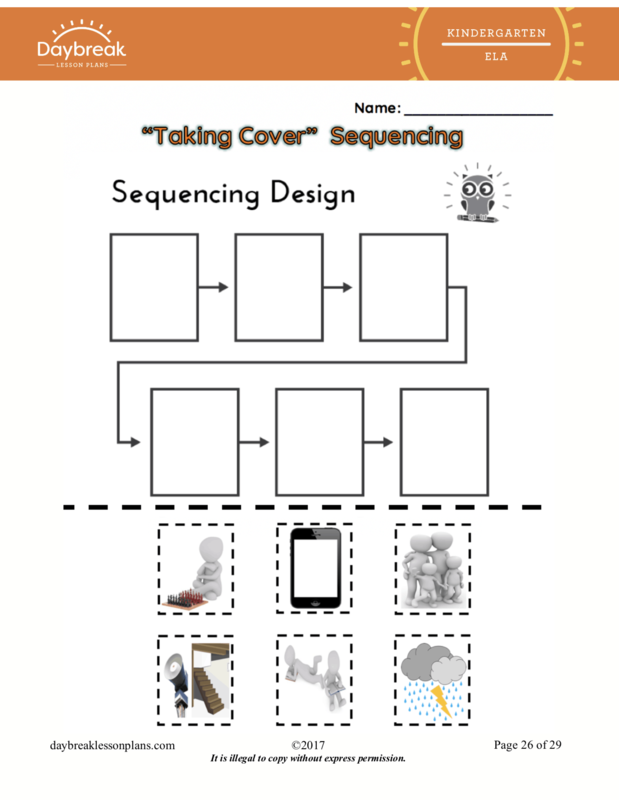 By asking and answering questions, and drawing images students will identify key details and retell the story in their own words. In addition, they will have the opportunity to "write" their own narratives. Like their students, teachers rarely achieve perfect attendance during the school year. If you’re a teacher, you will likely need to be away from your students at some point. You may be required to attend a two-day teacher conference. You, your spouse, your child or your pet might suddenly fall ill. You may need to leave school early in order to let a plumber into your home to fix a burst pipe. Whenever you must miss time in the classroom, you need a backup plan. 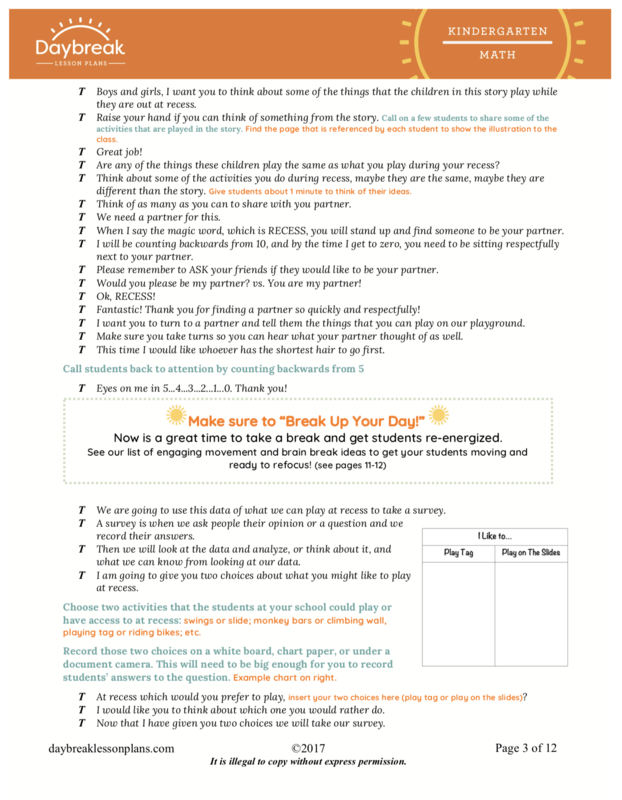 Daybreak Lesson Plans can provide you with one. 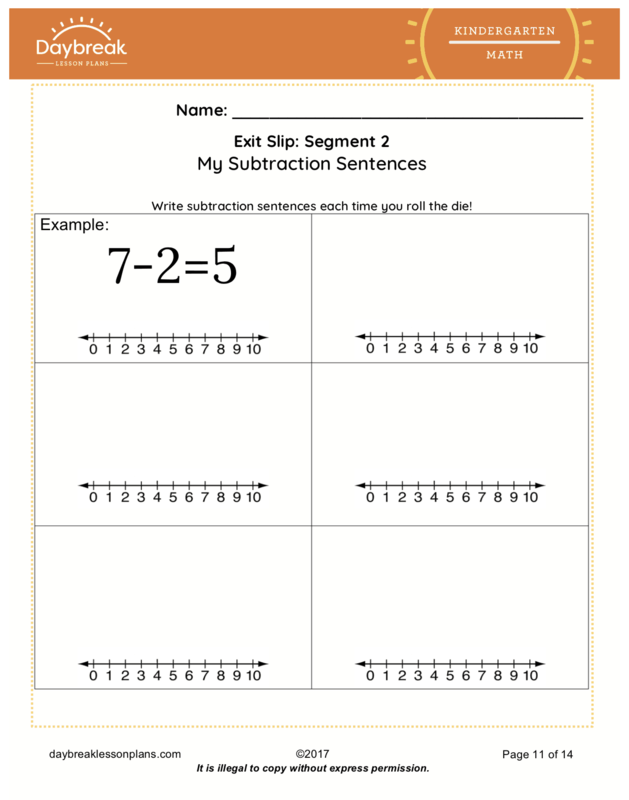 When you’re away from the classroom, you likely want to give your substitute teacher specific lesson plans that correlate to Common Core standards. However, the last thing you probably want to do is spend hours writing these plans. 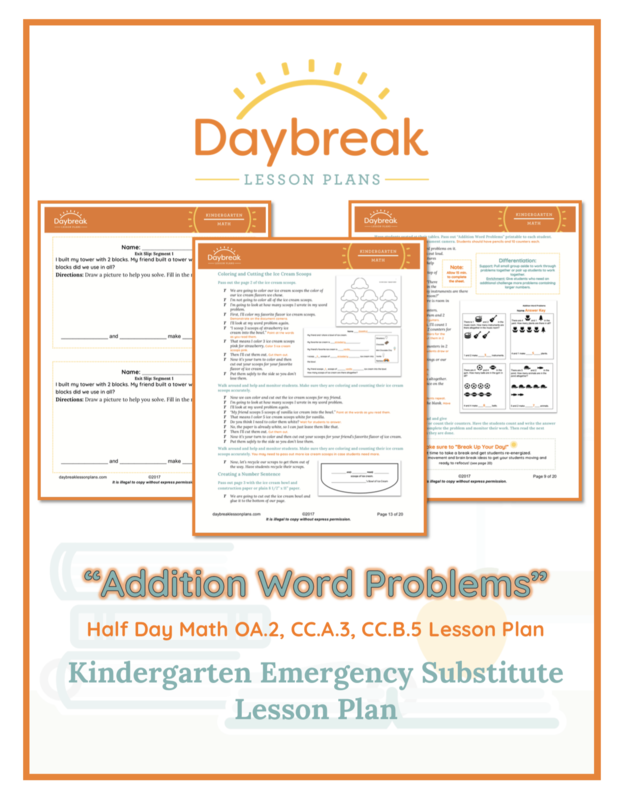 Daybreak Lesson Plans provides both teachers and administrators with Common Core lesson plans for kindergarten classes. During an emergency situation, time is of the essence. 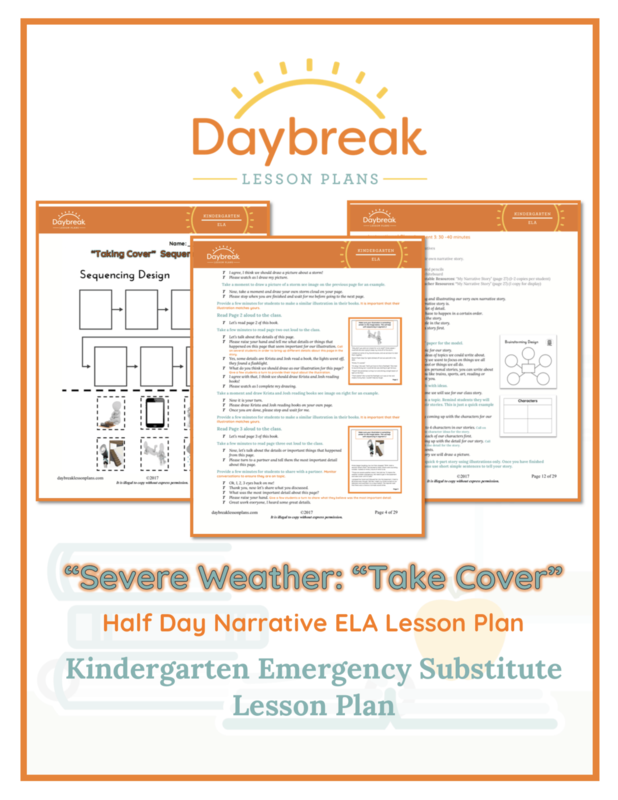 At Daybreak Lesson Plans, you can download a lesson plan for your substitute based on Common Core standards in minutes. 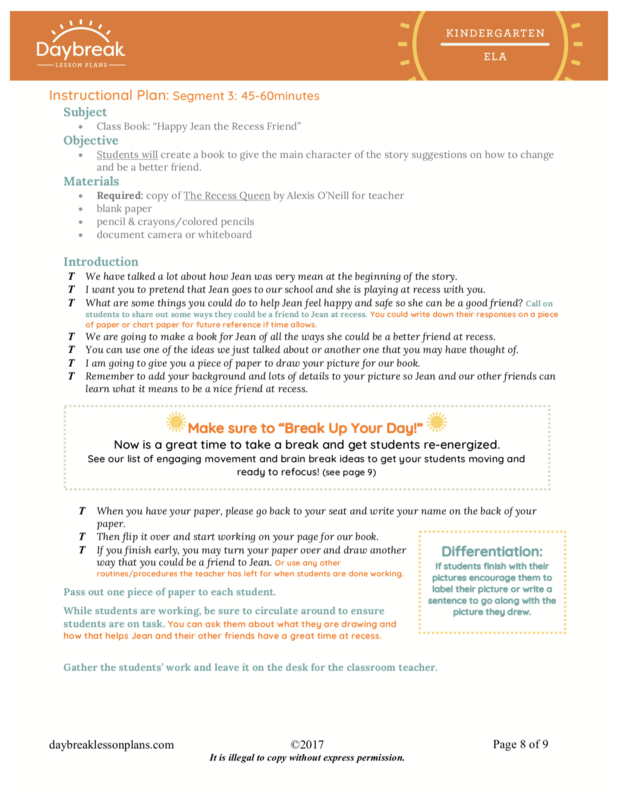 Requiring minimal copies, the lesson plan can be conveniently sent to your substitute or a secretary electronically. What Types of Kindergarten Lesson Plans Are Available? 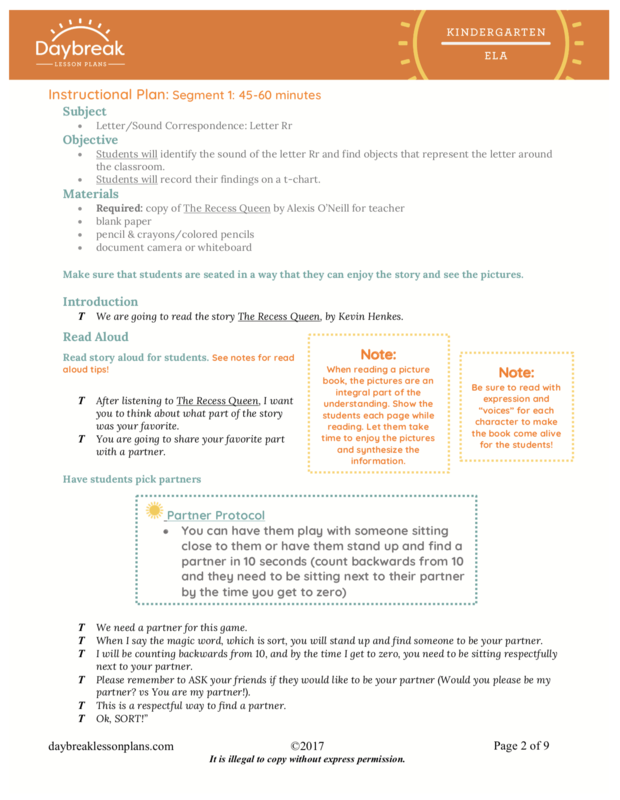 English language arts (ELA) lesson plans for kindergarten: Our English language arts lesson plans for kindergarten cover informational, literary and fiction topics. 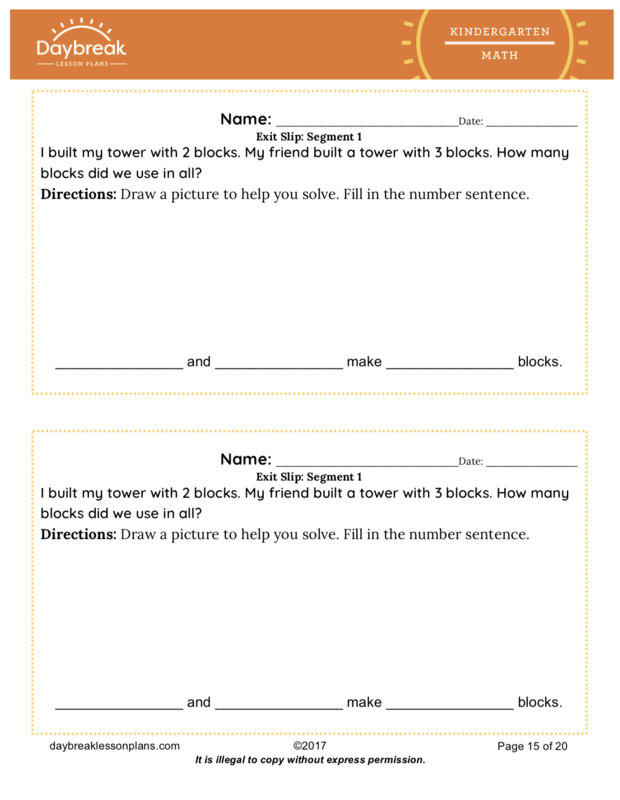 Math lesson plans for kindergarten: If you’re looking for engaging, interactive math lesson plans for you students, our subtraction lesson plans for kindergarten might be a good fit. 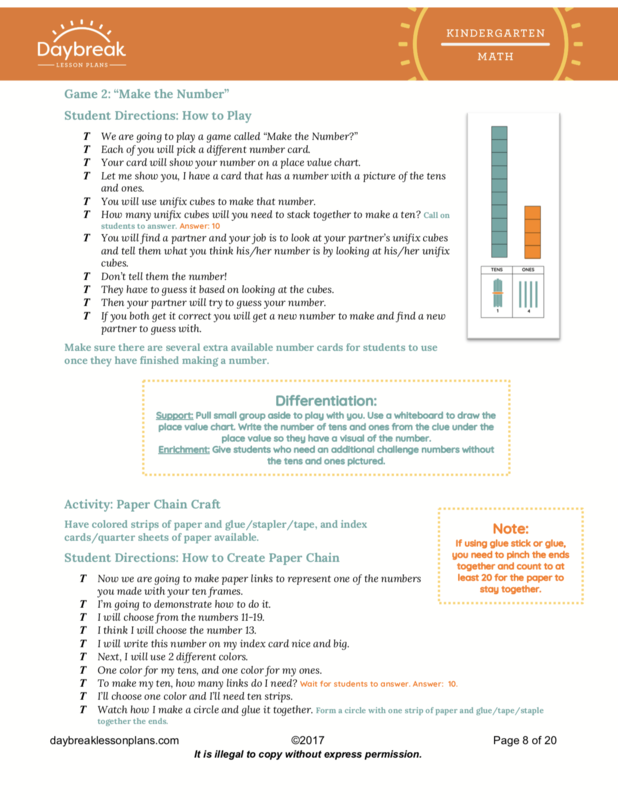 Math lesson plans span counting and cardinality, geometry, measurement and data, and operations and algebraic thinking subjects. 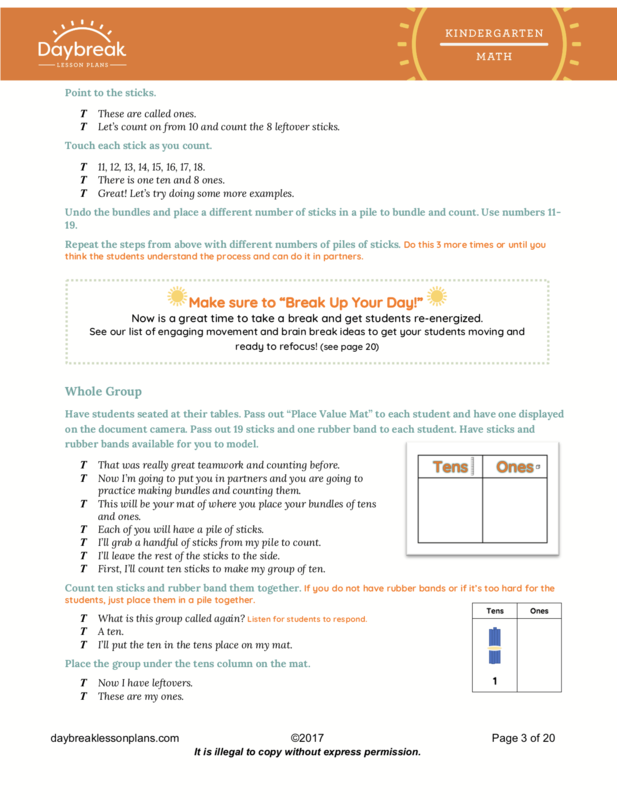 To supplement classroom learning, we offer stimulating games and activities. 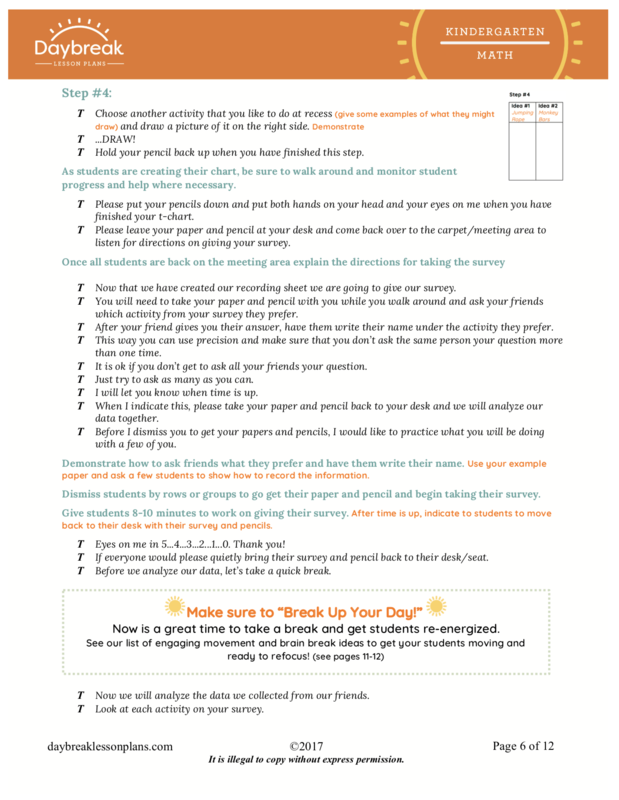 Each segment of our lesson plans also includes an exit ticket. Therefore, you’ll always know what your students learned during your absence. 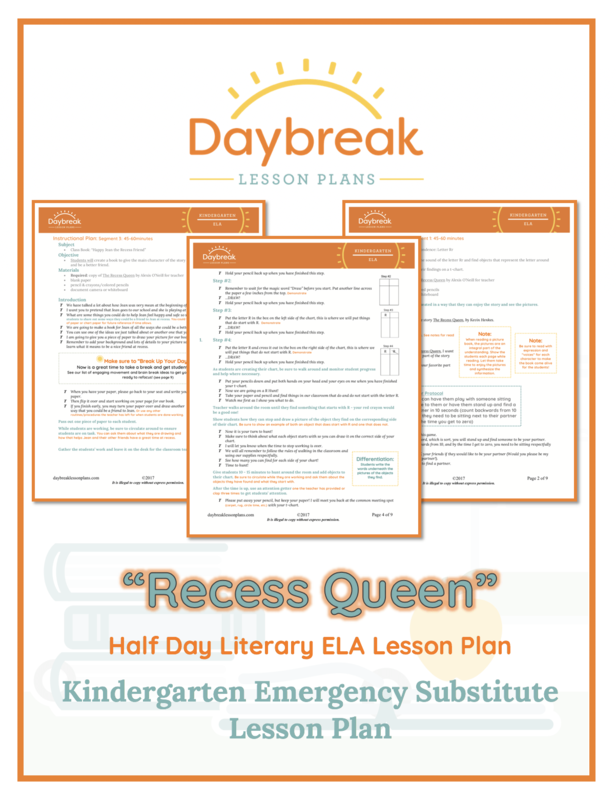 Why Choose Daybreak Lesson Plans? 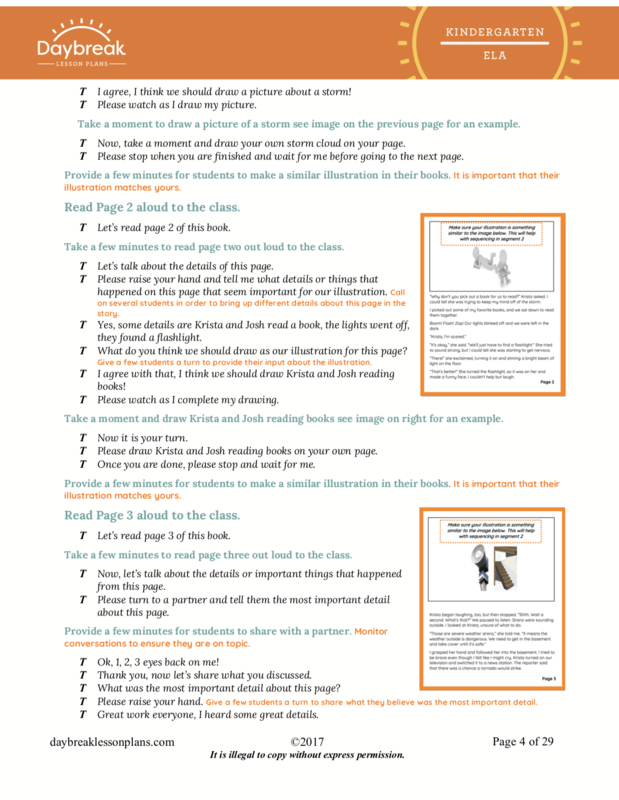 Created by experienced teachers: Writing detailed, informative lesson plans is a skill that teachers acquire from years of experience. 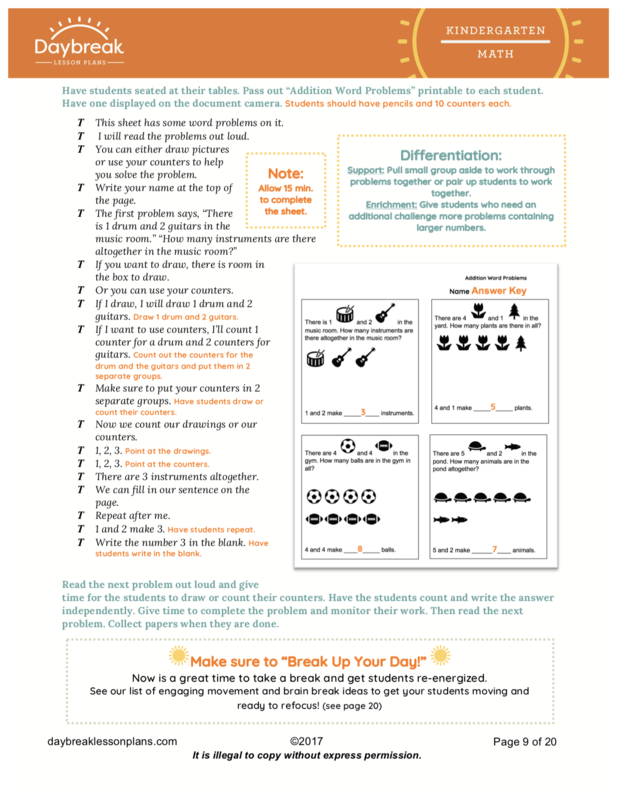 Our lesson plans are created by veteran teachers who have a strong understanding of Common Core standards. Written in a scripted format: When a lesson plan for a substitute isn’t easy to follow, problems can arise. The substitute might abandon the lesson plan quickly. Or, this individual may make mistakes while trying to execute it. 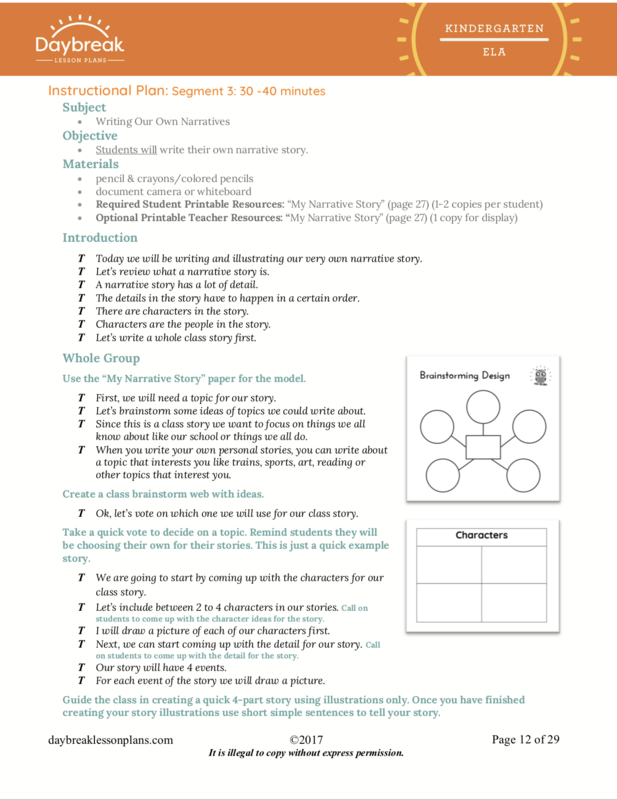 Our lesson plans are written in a scripted format, usable by inexperienced and veteran substitute teachers alike. Intended to meet various time requirements: If you only need a lesson plan for one hour, you likely wouldn’t want to purchase one designed for an entire day. 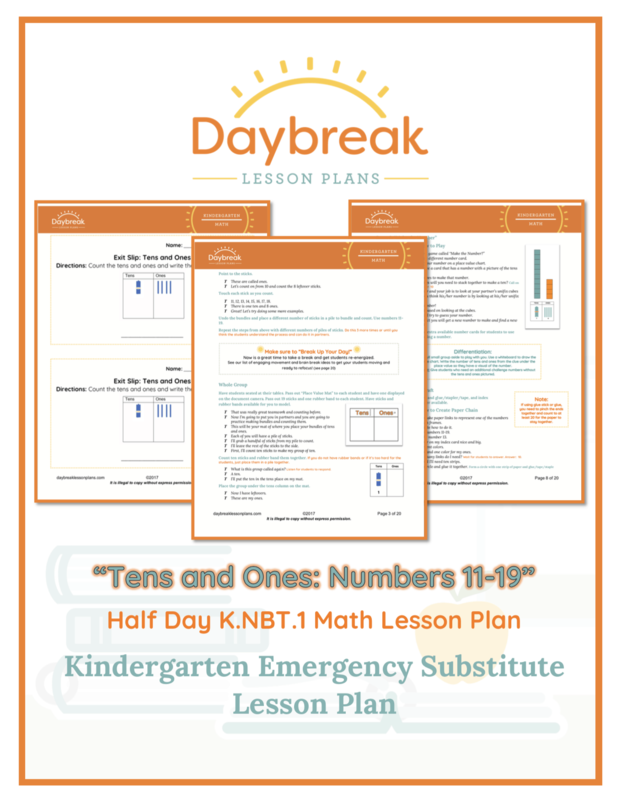 At Daybreak Lesson Plans, your individual needs are valued. 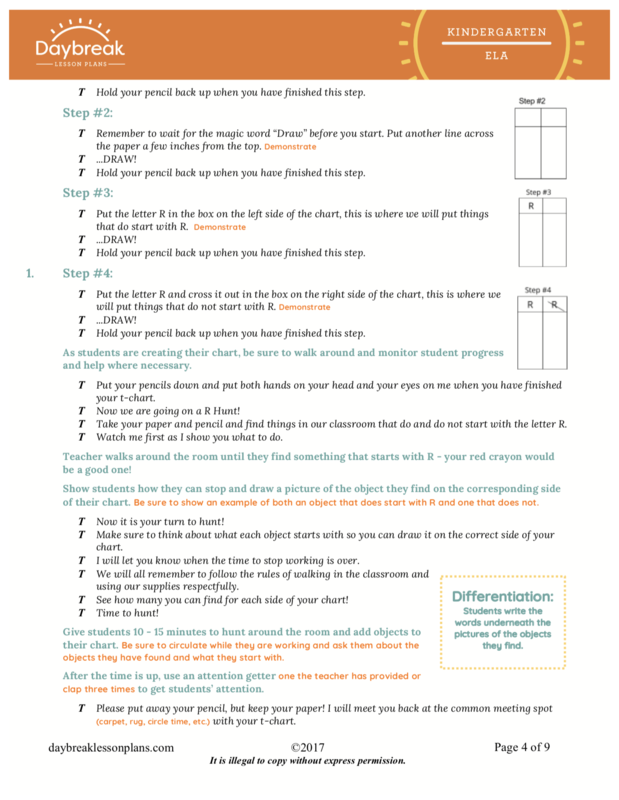 We provide lesson plans to fit various time spans from one hour to a full school day. 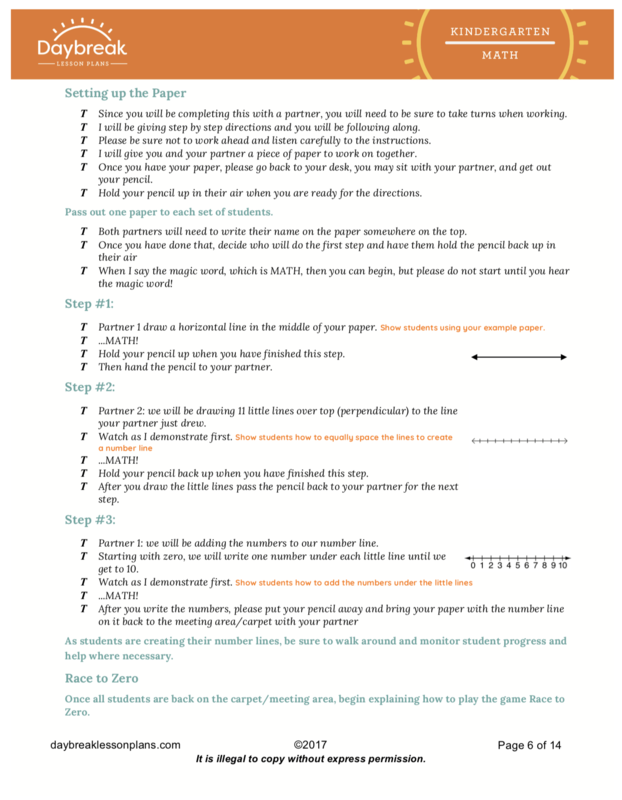 Feel free to browse our kindergarten lesson plans on this page. 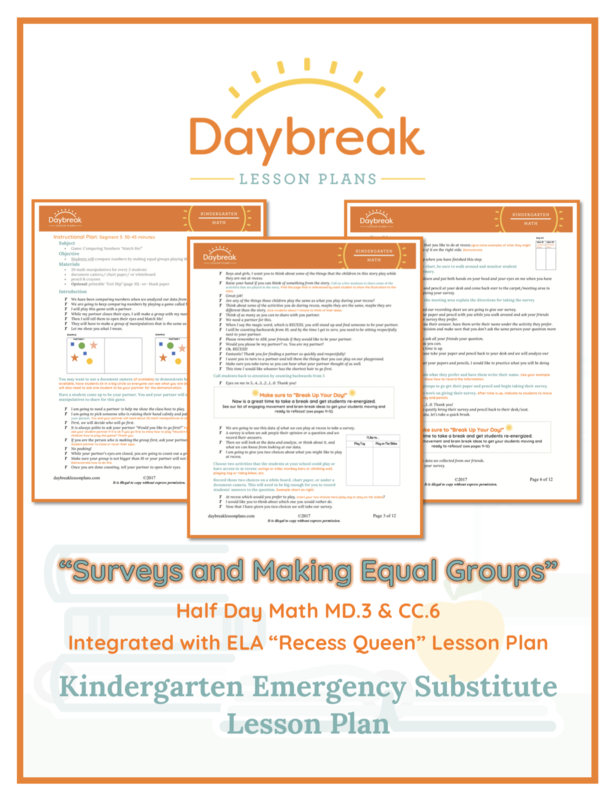 Should you have any questions, contact Daybreak Lesson Plans today.